I used to have the “meta” itch, but I learned to live with it and stop scratching it. It only irritates anyway, without doing much good work. If you are a regular (or even occasional) reader of Rationally Speaking you know that we often publish essays that have to do with ethics and moral philosophy. That's because ethics is one of those things that always lurks in the background (and sometimes the foreground) of our lives, whether we reflect on it or not. And I of course think it is better to reflect on it, at least from time to time. But invariably, regardless of what the specific impetus is for a given post, one or more of our readers brings up the “meta” question, i.e. the question of what could possibly ground our ethical judgments to begin with. Of course, meta-ethics is a legitimate branch of philosophy, and philosophers in general are properly concerned — at least from time to time — with meta-issues. But meta-issues are notoriously difficult, especially when they are approached from a so-called foundationalist perspective. A foundationalist in ethics, for instance may reasonably ask what grounds (notice the metaphor!) our ethical judgment in general (as opposed to asking what reasoning has brought one to a particular ethical judgment about whatever matter happens to be under discussion). There are, of course, a number of different approaches on offer: from divine law (yeah, I know) to conventionalism, various forms of moral realism and anti-realism, and so forth. I happen to be both a naturalist and a virtue ethicist, which meta-ethically speaking means that I think the ability to experience moral sentiments evolved in our social primate ancestors and has then developed culturally into a number of principled and practical ways to conduct one’s own life, as well as to deal with other people in a way that leaves as much room as possible for individual flourishing while also improving social justice. This way of looking at meta-ethics, of course, will not satisfy everyone, and perhaps for good reason. Nevertheless, pretty soon one needs to move away from the “meta” analysis and get down to everyday ethical judgments. Why? Because life demands it, darn it! Now, what strikes me as bizarre is how much resistance this obvious move from “meta” to ordinary ethics encounters, while the same people who so staunchly resist it appear to be little (or not at all) bothered by very similar “meta” questions one could reasonably ask about all sorts of other areas. Take science, for instance. Ever since Hume formulated his famous problem of induction — and despite much philosophical literature concerning it — we have known that we do not have a logical foundation for inductive reasoning. If that doesn’t bother you, it should. Induction, in its varied forms, is the basis of both common-sensical and scientific reasoning. So if we have no logical justification for induction it means we have no logical justification for pretty much any of our empirical knowledge, all scientific knowledge included! Oops. Now you might be tempted to scoff at the Humeans amongst us and respond that we know induction works because it has worked so far. I sincerely hope you’ll refrain from such a quick answer, though, because that would simply show that you haven’t understood the problem: you see, invoking the fact that induction has worked in the past to justify future inductions is itself an inductive move, which means that you are using induction to justify induction, which means that you are engaging in circular reasoning, which is no good at all. A more defensible response would be the pragmatic one: well, we may not have any logical foundation for using induction in everyday life and in science, but it seems to work, and we really have no alternative but to use it. If you went that route you would be in good company, beginning with Hume himself! But notice what you’ve just done: you have acknowledged the “meta” issue and promptly set it aside, because after all you’ve got a life to live, or a grant proposal to write. Why, then, can’t you do the same with ethics? Why does the meta-ethical hitch bother you so much, while you seem to be able to gingerly ignore the meta-scientific one? Indeed, things get even worse than that, if possible. I just came back from the annual meeting of the Eastern Division of the American Philosophical Association in Baltimore. The last session I attended was comprised of a single paper (accompanied by two detailed commentaries). The paper, by University of New Mexico’s Matthew Carlson, was entitled “What’s basic about basic logical principles?” and of course took its starting point from the known failure to foundationally justify some of the, ahem, basic principles of logic, such as the law of the excluded middle, or modus ponens. So, really, not even logic itself has a (logical?) grounding in something solid. Even that “meta” question seems unanswerable! But do you see logicians fretting too much about it, throwing logic away and going home? Not at all. Indeed, Carlson’s paper and the ensuing discussion reminded me of what these days (in philosophy) is a very acceptable and very decent way out of foundational conundra: the Quine gambit. W.V.O. Quine was one of the most influential and controversial philosophers of the 20th century, though I think he was off the mark on a thing or two (aren’t we all?). But one of his most famous moves was to introduce the metaphor of a “web of knowledge” to replace the commonly used one of an “edifice of knowledge.” Unlike buildings, webs don’t have foundations, they have (many) threads. And even though some of these threads are more important than others (at the risk of pushing the analog too far, some of those threads attach the whole web to a tree), none of the individual threads is irreplaceable. There is, in a web, no keystone you can take out and make the whole thing fall down. Rather, each and every thread can be replaced by other threads, if need be, without dramatically altering the structure of the web. For Quine, every scientific theory, all of mathematics, and even logic itself are threads in the human web of knowledge. 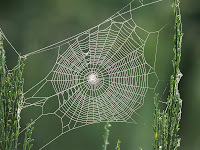 They all contribute to the structural integrity of the web, they reinforce each other, and if necessary they can all be replaced (though only a few at a time, just like in a spider web). Isn’t that a powerful picture? Don’t you feel the foundational hitch gradually lose its lure?